Woody Allen stars as a small-time slacker who becomes a front for several Blacklisted Hollywood writers, placing his name on their work. 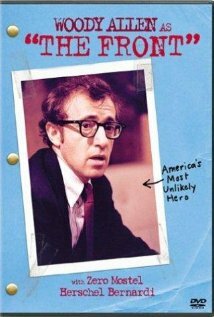 The Front is a 1976 dramedy based on real-life events which did not age well. Woody Allen is his Woody Allenest, and the screenplay is humorous, but the "farcical" slapstick comes across as forced pandering. The juxtaposition of comedic styles fails the film - as do the dramatic scenes, which also feel obligatory. The writing is capable, but nothing stands out, and the writers missed almost every opportunity the premise grants. The most important aspect of the film is the subject matter, and it does a decent job with that for the little time it is given. The Front is an important film - not just because of its subject matter, but also its cast and crew. While still relevant, the movie does not hold-up well. The Front is a 40-year-old film about events that occurred 25 years earlier, and while that was part of the movie's charm in its day, without historical context, much of this is lost on the audience. It has a lot of ground to cover, but - since the subject matter was recent, and still controversial, in 1976 - it forgoes that to tell a love story. That's the film's biggest flaw: A movie about TV sit-com writers using a bumbling, barely literate, bookie as a front which focuses on the main character's love life is 90 minutes of missed opportunities. Further, most of the romantic scenes rely on Woody Allen's signature cerebral anxiety - too much of the movie does, in fact (as do all of Allen's films) - where The Front should instead have emulated the dialogue, plots, and sensibilities that were prevalent on TV in the 1950s to satirical effect. The movie lampoons its subject, but the humor is subversive, with that "insider" feeling all showbusiness films have. To its credit, this much of the movie is great - the jokes are dark and crisp, and the barbs sting even today - but most of it is lost to the time and focus given the romantic angle. In fact, were The Front a TV sit-com episode itself, the actual subject of the movie would be the B-story to the love story. The movie feels anachronistic in general, but I'm no expert on the '50s or '70s. It may be the color palette, clothing styles, phrases employed - I'm not sure - but it seems like it was trying to be current while capturing the feel of a bygone era in a timeless way. We see this a lot, even today - a period piece filtered through modern sensibilities - and these movies rarely age well, especially when dealing with timely and/or controversial issues. In fact, the sensitivity of the issue may well be the reason the movie focuses on the romantic plot. The Front's confused tone should be redeemed by the revelation that many of its collaborators were themselves victims of The Hollywood Blacklist, but it isn't. The ending is anti-climactic and unsatisfying. It could be interpreted many ways - his testimony changed nothing, but he got the girl and that's what matters; political correctness as a tool of oppression and censorship is an ongoing issue; you all know how the story goes, so we'll end our show here - but it plays like they ran out of money and just pulled the plug. What should have been a scathing, satirical farce of history, politics, and the TV industry is instead a mediocre, slice-of-life, everyman-as-hero rom-com. The Front had a lot of potential it did not live up to, but political pressure and the prevailing attitudes of the time may be to blame.